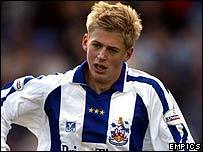 Blackburn have signed 20-year-old Huddersfield striker Jon Stead for a fee of "more than £1m". Stead signed a four-and-a-half year deal at Ewood Park as boss Graeme Souness ended his long search for a frontman. "Jon is a player we have watched and had good reports about," said Souness. "He has natural enthusiasm and ability. We believe he will prove to be a valuable asset," he told the club's official website. Stead - who was heavily linked with a transfer to First Division Sunderland - was delighted to move into the Premiership. "I am living the dream. Everyone wants this opportunity and I've got it," said Stead. "There are not many young English strikers knocking around and I want to go on and on. "I feel that in coming here, being and working with the players can only make me better." The deal was completed after Blackburn tabled a fourth offer for the striker who has scored 20 goals this season. Huddersfield rejected a bid from Blackburn on Friday, and Sunderland failed with a late bid for Stead.